Miller Electric Mfg. Co. has announced two new accessories for submerged arc welding (SAW) systems. While the Three-Wheeled Tractor is a smaller size, which will improve flexibility in SAW applications, its 30 - 90 mm External Cladding Head optimises feeding of cladding strip for improved weld quality in SAW and electroslag cladding applications. 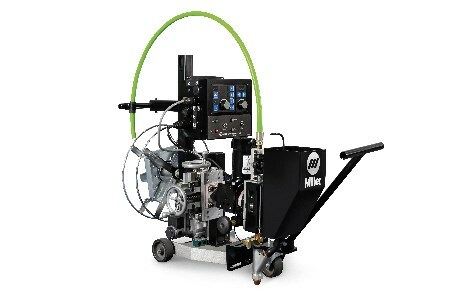 "Miller welcomes submerged arc welding accessories "
The Three-Wheeled Tractor can be configured into multiple positions, providing greater flexibility and setup options in SAW applications. It also has a compact size. In addition, the new SubArc Tractor Interface Digital is an all-in-one interface that allows welding operators to control the tractor and the welding functions from the same panel, for ease of use. The tractor also has regulated speed control technology, which allows the system to automatically adjust welding travel speeds based on changes in weight, angles or other variables. This helps to ensure that travel speeds remain at set parameters for improved weld quality and productivity. The 30 - 90 mm External Cladding Head has a full width strip drive roller that includes independent adjustments at three separate points – one for each 30 mm increment – compared to only one point of adjustment for other cladding heads on the market. This allows welding operators to adjust pressure in three areas across the cladding strip, to optimise strip feeding. Having the ability to fine-tune the pressure allows welding operators to optimise the external cladding head performance for the specific needs of the application. In addition, individually adjustable spring loaded contact jaws provide optimal current transfer, reducing the risk of cladding failures. The external cladding head is designed for many submerged arc and electroslag cladding applications, including pressure vessel, pipe, petrochemical and offshore.